Original Editors - Bruce Tan as part of the from Bellarmine University's Pathophysiology of Complex Patient Problems project. Heterotopic Ossification (HO) refers to the formation of lamellar bone inside soft tissue structures where bone should not exist. 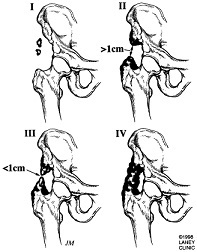 The development of HO is extra-articular and occurs outside the joint capsule. The new bone generally does not involve the periosteum. The HO may also attach to the cortex of adjacent bone, with possible cortical disruption. This process can occur in structures such as the skin, subcutaneous tissue, skeletal muscle, and fibrous tissue adjacent to bone. In more rare forms, HO has been described in the walls of blood vessels and intra-abdominal sites such as the mesentery. The primary risk factor for HO is inciting trauma. Additionally, inflammation has been shown to play a role in the formation of HO due to osteoprogenitor cells being stimulated to proliferate in that environment. Additional factors are described in further detail in the Etiology section. Although HO can be found at any site, it is most prevalent in the major joints such as the hip, elbow, shoulder and knee. HO was first described by Patin in 1692 while working with children diagnosed with myositis ossificans progressiva. In 1918, Dejerine & Ceillier detailed the anatomical, clinical, and histological features of ectopic bone formation in soldiers who sustained spinal injuries during World War I. The exact pathophysiology of HO is unknown. The transformation of primitive mesenchymal cells in connective tissue into osteoblastic tissue and osteoid involve diverse and poorly understood triggers. These triggers include genetic, post-traumatic, neurogenic, post-surgical, and reactive lesions of hands and feet. Genetic forms include two types: Fibrodysplasia Ossificans Progressiva (FOP) and Progressive Osseous Heteroplasia(POH). These types are described as massive deposits of heterotopic bone around multiple joints in the absence of an inciting event (i.e. trauma). This is the most severe type of HO, progressively forming throughout the life and severely effecting health, life expectancy, and quality of life. Post-traumatic HO begins with spindle cell proliferation within the first week of the traumatic event. Within 1-2 weeks, primitive osteoid develops. After the second week, primitive cartilage and woven bone can be seen. Trabecular bone forms 2-5 weeks after the trauma. Amorphous calcium phosphate is gradually replaced by hydroxyapatite crystals as the mineralization progresses. After about 6 months, there is an appearance of true bone in the connective tissue between the muscle planes. 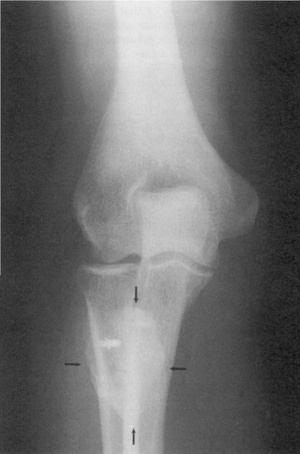 Neurogenic heterotopic ossification occurs after sickle cell anemia, hemophilia, tetanus, poliomyelitis, multiple sclerosis, and toxic epidermal necrolysis. Neurogenic HO develops only in sites distal to the level of the spinal cord injury. The areas affected by HO are almost always on the affected side of brain injury or stroke. Post-surgical HO most commonly develops after procedures which require open reduction, internal fixation and joint replacement surgeries, with THA being the most common. tous, florid reactive periositis, and subungual exostoses. In a recent study, Foruria et al. looked at the prevalence of heterotopic ossification in all elbow pathologies entering an emergency room over a 5 year period. They found the highest prevalence of HO occurred in terrible triad injuries, transolecranon fracture-dislocations, and an associated distal humeral fracture. The location of the ossification was most commonly found on the posterior aspect of the ulna. Risk factors for HO include dislocation or subluxation at the time of injury, open injury, and severe chest injury. When a pathology was treated surgically, 37% of participants developed an ossification. Clinical signs and symptoms of HO may appear as soon as 3 weeks or up to 12 weeks after initial musculoskeletal trauma, spinal cord injury, or other precipitating events. The first sign of HO is generally loss of joint mobility and subsequently loss of function. Other findings that may suggest the presence of HO include swelling, erythema, heat, local pain, palpable mass, and contracture formation. In some cases, a fever may be present. Differential Diagnoses: The initial inflammatory phase of HO may mimic other pathologies such as cellulitis, thrombophlebitis, osteomyelitis, or a tumorous process. Other differential diagnoses include DVT, septic arthritis, hematoma, or fracture. DVT and HO have been positively associated. This is thought to be due to the mass effect and local inflammation of the HO, encouraging thrombus formation. The thrombus formation is caused by venous compression and phlebitis. 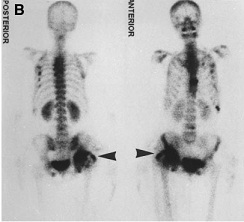 Brooker did not describe a class 0 but subsequent studies using the Brooker classification have defined Class 0 as the absence of radiographic HO. Clinical Note: the lack of simple objective measures in detecting heterotopic bone formation causes HO to be misdiagnosed in the early stages, leading to delayed treatment. Evidence shows that there are no systemic effects secondary to the formation of heterotopic ossification. The most common sites where this condition presents are the hips, knees, spine, elbow, wrists, hands, and any site which is involved in a traumatic event. The treatment of heterotopic ossification is largely dependent on the amount of ectopic bone formation, the location and the associated functional limitations of the patient. The first goal of medical management is to identify those patients at risk for developing HO and treating them prophylactically. Research supports two other approaches for the medical management of HO: 1)surgical excision and 2) radiation therapy. The use of radiotherapy as a prophylactic treatment comes mainly from the literature concerning total hip arthroplasty. A dose of 700-800 cGy of local radiation in the first four post-operative days has shown to prevent HO formation in patients who are at high risk. Clinical Note: Clinicians must be aware of potential complications (mainly GI related) with patients taking NSAIDS on a routine basis. The above timetables were established to determine the most optimal timing of surgical intervention. Clinicians must determine if the lesion has reached maturation before surgical excision to decrease the risk of intraoperative complications such as hemorrhage, and the reoccurrence of the ectopic lesion. The use of bone scans to determine metabolic activity of the lesion and serum ALP levels are common aids in this decision making process. 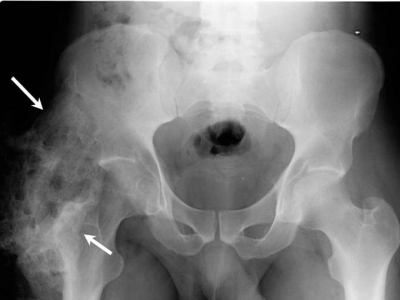 Significantly limited ROM of involved joint (e.g., hip should have < 50 deg ROM) for most patients, progression to joint ankylosis is the most serious complication of heterotopic ossification. Absence of local fever, swelling, erythema, or other clinical findings of acute heterotopic ossification. Normal serum alkaline phosphate levels. Return of bone scan findings to normal or near normal; if serial quantitative bone scans are obtained, there should be a sharply decreasing trend followed by a steady state for 2-3 months. It is recommended that a rehabilitation program should start within the first 24 hours after surgery. The program should last for 3 weeks to prevent adhesion. Physical therapy has been shown to benefit patients suffering from heterotopic ossification. Pre-operative PT can be used to help preseve the structures around the lesion. ROM exercises (PROM, AAROM, AROM) and strengthening will help prevent muscle atrophy and preserve joint motion. Clinical note: caution must be taken when working with patients with known heterotopic lesions. Therapy which is too aggressive can aggravate the condition and lead to inflammation, erythema, hemorrhage, and increased pain. Casavant and Hastings also provide great insight into the evaluation and management of heterotopic ossification in their article titled Heterotopic Ossification about the Elbow: A Therapist’s Guide to Evaluation and Management. Clinical Note: The two studies used above were primarily focused on rehabiliatation of the elbow secondary to heterotopic ossification. However, the goals and stages of the rehabilitation process can be used as a guide when treating at other sites. This case details the complications one man experienced due to the development of post-operative Heterotopic Ossification in his lumbar spine. A total disc arthroplasty is a relatively new treatment strategy for lumbar discogenic back pain that has shown promising short- and intermediate-term results. Specific complications that can accompany total disc arthroplasty include vertebral body fracture, heterotopic ossification (HO), implant malposition, and early or late component extrusion. This case details a posterior component placement contributed to heterotopic bone growth within the spinal canal, causing neural impingement and radiculopathy and ultimately requiring component extraction, decompression, and lumbar arthrodesis. Subjective: 45 y/o male presents to the clinic with new onset R leg pain. He denies paresthesias or the loss of motor function, and he also denied a prior history of HO formation, trauma, or inflammatory arthritis. His PMH includes L5/S1 lumbar total disc arthroplasty 2 years ago for discogenic back pain. He reports that following surgery he had a significant reduction in his symptoms but developed this new pain about 6 months ago. Objective: Physical examination revealed limited lumbar ROM in forward flexion due to R leg pain, positive single leg raise test, strength was 5/5 for all major muscle groups, intact sensation, and normal (2+) reflexes. Radiographs demonstrated implant encroachment into the spinal canal with heterotopic bone formation outside the margins of the disc. Computed Tomography Myelogram revealed compression of the traversing nerve root secondary to the inferior endplate of the implant that resided posterior to the margin of the vertebral endplate as well as an associated posterior bone growth further into the canal. Patient demonstrates decreased lumbar ROM, with a history of trauma to the lumbar spine due to the lumbar disc arthroplasty. These factors and the positive imaging resulted in the patient being diagnosed with HO. Patient elected to undergo surgical removal of his lumbar arthroplasty with fusion of L5/S1 and HO decompression. Patient returned to physical therapy post operatively for recovery. 6 weeks post operatively patient reports complete relief of his radicular leg pain. Radiographs demonstrate a solid fusion without recurrence of HO formation. As a physical therapist it is important to consider HO in your differential diagnosis when treating patients with a history of trauma or surgery. It is especially important to remember the signs and symptoms of HO when treating patients with limited ROM. We may be the first health professional to recognize the development of HO. Tibiofibular Syndesmosis and Ossification. Case Report: Sequelae of Ankle Sprains in an Adolescent Football Player. Kennedy MA, Sama AE, Sigman M. Tibiofibular syndesmosis and ossification. case report: sequelae of ankle sprain in an adolescent football player. Journ of Emer Med 2000; 18: 233-240. Heterotopic Mesenteric Ossification ("intraabdominal myositis ossificans): A Case Report. Bovo G, Romano F, Perego E, Franciosi C et al. 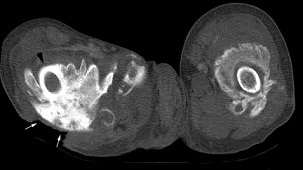 Heterotopic mesenteric ossification ("intraabdominal myositis ossificans"): a case report. International Journal of Surgical Pathology 2004; 12: 407-409. A Case of Psoas Ossification from the use of BMP-2 for Posterolateral Fusion at L4-L5. Infrapatellar Heterotopic Ossification after Anterior Cruciate Ligament Reconstruction. Heterotopic Ossification of the Ulnar Collateral Ligament: A Description of a Case in a Top Level Weightlifting Athlete. ↑ 1.00 1.01 1.02 1.03 1.04 1.05 1.06 1.07 1.08 1.09 1.10 1.11 1.12 1.13 1.14 Mavrogenis AF, Soucacos PN, Papagelopoulos PJ. Heterotopic Ossification Revisited. Orthopedics. 2011Jan;34(3):177. ↑ 2.0 2.1 2.2 2.3 2.4 2.5 McCarthy EF, Sundaram M. Heterotopic ossification: a review. Skeletal Radiol 2005; 34: 609-619. ↑ 3.0 3.1 3.2 3.3 3.4 3.5 3.6 Firoozabadi R, Alton T, Sagi HC. Heterotopic Ossification in Acetabular Fracture Surgery. Journal of the American Academy of Orthopaedic Surgeons. 2017;25(2):117–24. ↑ 4.0 4.1 4.2 4.3 4.4 4.5 Bossche LV, Vanderstraeten G. Heterotopic ossification: a review. J Rehabil Med 2005; 37: 129-136.5. Pape HC et al. 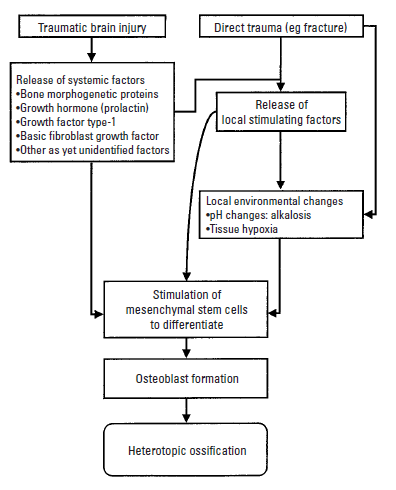 Current concepts in the development of hetetrotopic ossification. Journ Bone and Joint Surg 2004; 86: 783-787. ↑ 5.0 5.1 5.2 5.3 Pape HC et al. Current concepts in the development of hetetrotopic ossification. Journ Bone and Joint Surg 2004; 86: 783-787. ↑ 6.0 6.1 6.2 6.3 6.4 6.5 6.6 6.7 Hsu JE, Keenan MA. Current review of heterotopic ossification. UPOJ 2010; 20: 126-130. ↑ 7.0 7.1 7.2 7.3 7.4 Foruria AM, Augustin S, Morrey BF, Sanchez-Sotelo Joaquin. 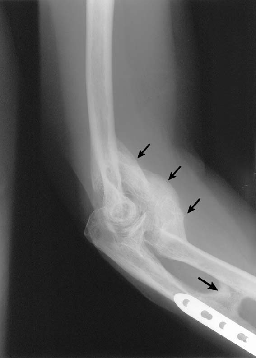 Heterotopic Ossification After Surgery for Fractures and Fractures-Dislocations Involving the Proximal Aspect of the Radius or Ulna. The Journal of Bone and Joint Surgery, Incorporated. 2015May15;95-A(10):e66(1)-e66(7). ↑ 8.0 8.1 Dalury DF, Jiranek WA. The incidence of heterotopic ossification after total knee arthroplasty. Journal of Arthroplasty 2004; 19: 447-457. ↑ 9.0 9.1 9.2 Shehab D, Elgazzar AH, Collier BD. Heterotopic ossification. Jour of Nuclear Medicine 2002; 43: 346-353. ↑ Hug KT, Alton TB, Gee AO. In Brief: Classifications in Brief: Brooker Classification of Heterotopic Ossification After Total Hip Arthroplasty. Clinical Orthopaedics and Related Research®. 2014;473(6):2154–7.